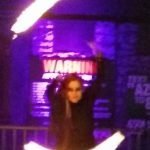 Azra Chamber of Horrors Haunted House is a Haunted Attraction located in Madison Heights, MI. Team Michigan Macabre reviewed this Haunted Attraction on October 21, 2018. 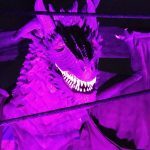 This is Azra’s first year in operation and we were utterly amazed at what this haunt has to offer! This is a brand-new haunt, but you would never be able to tell due to all of the effort put into the details, in the actors and staff, and the extras provided solely to entertain your soul. Who or what is Azra? Azra will be the first entity you encounter, which is the dragon poised outside of the building – the one in charge. The story reflects that, in the past, there were many quests for lasers (tying in the roots of their building, historically being Laser Quest) and, when the final battle concluded, the last of the light diminished with it. When that occurred, all of the souls were trapped within, while Azra kept watch, holding them in their chambers for eternity. Fear is what feeds Azra, and he welcomes you with your untapped fear to enter his walls and seek a way out – a way out that he will forbid you from finding. Your fear fuels him. Will you encounter something within Azra’s Chambers that will release your fear? There were plenty of actors to go around due to having 40-50 actors per night on staff. With being a new haunt, we were skeptical about the actors’ ability, but we were wrong to have doubt. Azra has some of the best actors we have encountered. Their talents were all-encompassing from scaling fences and crawling creepily on the floor, to uttering sounds that could have been found within the movie Jurassic Park. “I swear that was a dinosaur next to me!” – words spoken by yours truly. Starting at the beginning with the “keeper of the chamber,” he had us participating so much we were dancing along to Theodore’s music! However, we did hear a few generic “wanna play?” types of questions from some actors, which was somewhat of a disappointment. I will say that a majority of the actors are those blending in with the atmosphere of Azra, and I say “atmosphere” instead of “background” for a reason – this will be explored more in the Special Effects section! The actors were stealthy, hidden, and did not overdo their presence. I think they were the best scares because we truly did not see them coming. Don’t get me wrong; there were those who actively interacted with us – the clowns and the butcher, for instance. The butcher did an excellent job at holding our attention by including us in his dinner ritual and making us feel a little too welcome. The clowns repeatedly circled back to us for more opportunities to scare; one clown honestly startled me four separate times. How did he do that?! We came across many victim type actors who did a great job showing their desire to be freed from Azra. So much so, we heard one victim scream her home address begging for us to help get her out. Might I add, our team felt this performance was so authentic we remembered said address and looked it up to see if she genuinely was a “lost” soul; not kidding… we looked it up. A phenomenal scene including the mannequin actors was eerily unique and left a nightmare-quality impression. We won’t spoil that chamber for those who have yet to experience it! The costuming within Azra was overall of good quality. The actors that had specific roles were wearing appropriate and detailed garb. The clowns all looked very well done. No poorly done costumes stuck out, and those whose job it was to lurk in the shadows or dissolve into the scenes did so with help from their spot-on costuming! Azra is very easy to locate, mainly due to the enormous dragon outside with sound effects, changing colors, and fog. They do not have much parking in their lot, but they do have good signage to direct you to nearby establishments. We parked at a nearby church. The ticket booth is labeled well and in full view. The ticket booth is in the front, and the queue line is around the back of the building. There was only one safety concern that we noted. Right at the beginning, there is a step that it seems like none of our group saw. We all almost tumbled one at a time. You would think after seeing the first few people do it, the last few would catch on, but not so much. The staff members were all very nice, from the woman in the ticket booth to the people selling swag. On site, security was also observed and their website is straightforward and informative. Azra has two separate atmospheres: the one you walk up to in the front with the dragon surrounded by cables and a burning victim, and the one you get once you walk around back. WOW! I thought a house nearby was having a party when I turned that corner only to find out it was Azra! Azra goes miles beyond what we have seen some other haunts do for their atmosphere before entering the haunt. Music was pumping, the disco lights were flashing, and entertainment was in high-gear. There were what looked like two projection screens, but only one was on and playing a movie while we visited. The queue lines were outdoors, but covered by tents, and space heaters were even provided for some areas by the front. Did I mention the fire performers yet? 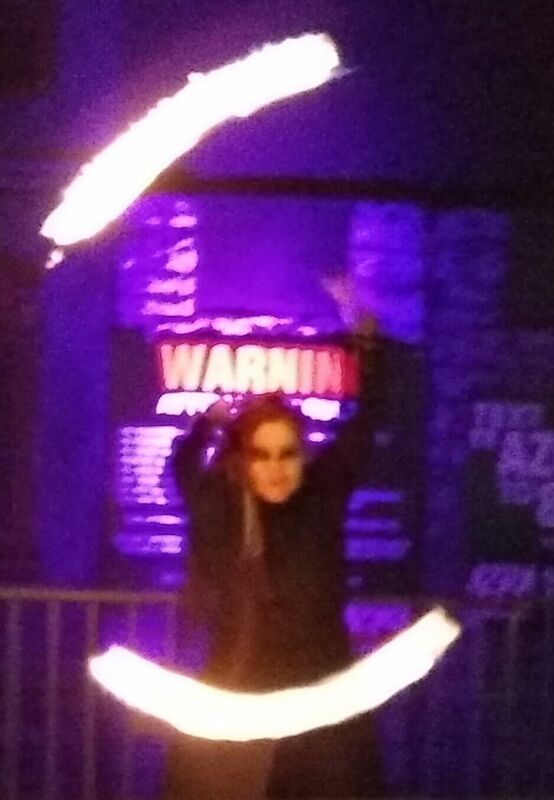 Oh yeah… you know, run-of-the-mill fire performers, juggling fire with sword-throwing clowns – completely the norm. This form of entertainment varies per night. Additionally, food trucks are also camped out to provide yummy quality food for their patrons while waiting. Portable restrooms were outside and, when you exit the haunt, you are in the Escape Room portion of the building, which also has indoor bathrooms available. Azra owned this category. There was so much going on I am sure I cannot include it all here, you will have to experience it for yourself! The sounds within the chambers of Azra blend well with the scenes and experiences you endure. Noticeably, there was a creepy “lost souls” type soundtrack throughout. The cries of those trapped was a common backdrop. Many screams can be heard in the distance, but never truly within reach. The lighting and use of fog were impressive. Azra’s ability to silhouette those trapped souls climbing the cages and crawling on the floors around you was an excellent feature. I caught myself walking slower to take in the massiveness of those scenes. Their skillful use of these aspects provided a good balance to allow the actors to remain stealthy, but also make all the details in the walls and scenes observable. Often, you’ll find yourself walking up or down sloped floors, as they utilize all of the space available. One part worth noting is, while walking up a slope, people are banging on the floor beneath you, which entirely places you into this mindset that there are trapped beings beneath you, a very unique touch. There were animatronics galore within Azra… plenty to keep us saying, ”Ooooh, look at that,” but not so many that they relied on them to keep the haunt entertaining. No spoilers here, but we saw more than one huge display or animatronic that we have never seen before. One left us “buzzing,” and another monstrosity was clowning around with something explosive! Keep your eyes open because they were everywhere! A couple of times, we were not able to fully see what something was due to the lighting and fog; that bummed us out. Hands down, the coolest portion was Azra himself when he welcomes you into his chambers; being able to see him in that form was a great way to start the haunt! Worth mentioning were the original scenes within Azra that used mirrors, strobe lights, and mannequins. There was a portion with 3D glasses to disorient you and even a funhouse adventure to ride. The theme of Azra is focused on the building’s roots, thus providing a connection to the community. This theme is explained at the beginning by the Keeper of the Chamber, with the help of Theodore and Azra himself. The theme is carried mostly through the whole haunt, but not all of it. There are a few chambers that don’t entirely fit the theme; they were scary, nonetheless, but seemed to be outside of the theme. We noticed a good effort to maintain the idea throughout. Incorporated within Azra are many different scares. Our team’s favorite had to be the actors who seemingly appeared out of thin air; they were hidden so well into their environment. One of the final actors of the night got us good with a simple distraction scare, but completely caught us off guard. One memorable drop wall scare comes to mind as the actors screaming from behind it had incredibly-startling voices. Some of the scares were predictable, but again, quite a few caught us off guard. The finale was one chainsaw-wielding woman. It was just okay, it did not leave us running to escape Azra. With being a first-year haunt, we appreciate that there was a finale at all, which is often overlooked. The entertainment provided while in the queue line was very much appreciated. Azra strives to provide you with an experience, not just a haunted house to shove you through, and that they did. 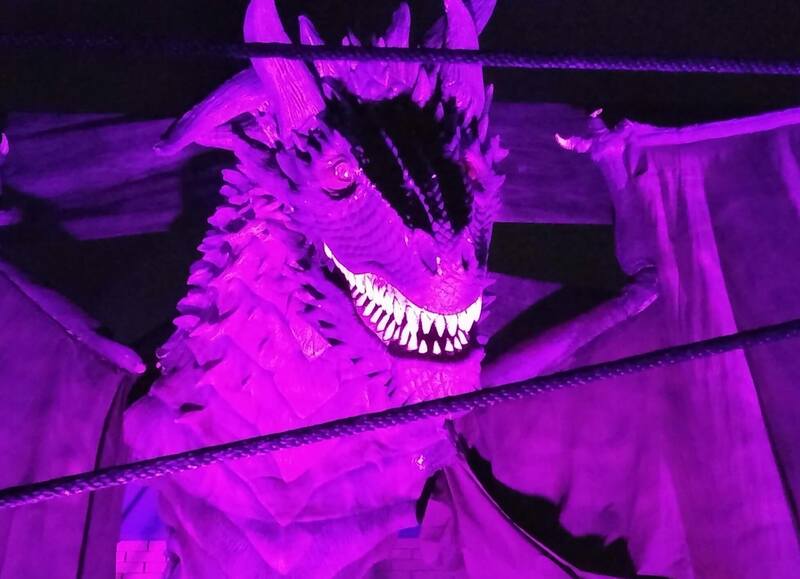 The moment you pull up and see the dragon to the end when a 10-foot-tall devil says goodbye, all provided us with great entertainment. General admission is only $20 and, considering all of the entertainment you receive for that $20, this is a great haunt to spend your money visiting! $30 gets you a fast pass and $40 gets you to skip the line altogether. We were through Azra in 18 minutes, which provides them with a minute per dollar score of 0.9, which is typical for this area. Azra made great use of the available space they have. There is limited space out front by the road, which is why the queue line party is in the back, and there is ample room for the entertainers to perform. Also, within the haunt, they use multiple levels sending you down to lower areas and walking up ramps to utilize the space effectively. Lastly, Azra takes group photos as you make your way through the haunt. These pictures are posted to the haunt’s Facebook page and freely accessible if you want to snag a copy! Has potential to be one of the better haunts in MI. BUT they need to train their actors better, …show more increase the length, and provide more scares. Really great new haunt! Am so happy that we went and checked it out. Didn’t know what to expect …show more because it is their first year but they really blew us away! Great theming, actors were really scary, the props were awesome. Great value for the money was only $20 to get in.